Whew, I’m here and recovering from a busy week. I’ve been in Sacramento for the last two days for all day IT certification training and all that new information in a short amount of time can be exhausting. I need to gather my notes and study the material to take an exam in the next two weeks now, yay. It was nice to get a change of scenery and do something different from my job, but that commute got old after only two days, tons of traffic and stress. I’ll be glad to get back to my short commute Monday. 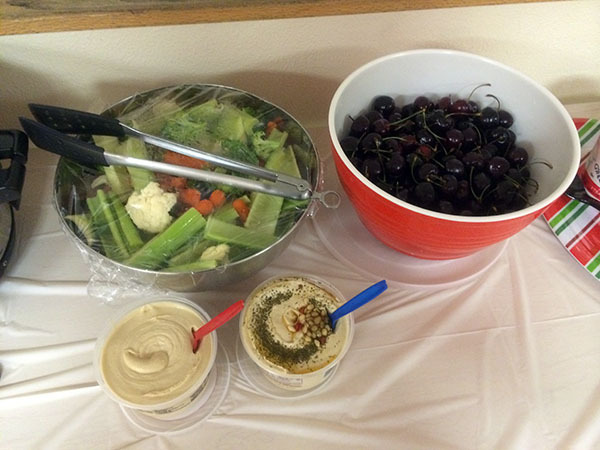 Earlier this week our department had another potluck to celebrate the 4th or July early and I will say we’re getting better at doing potlucks considering our department never did them until about 8 months ago. 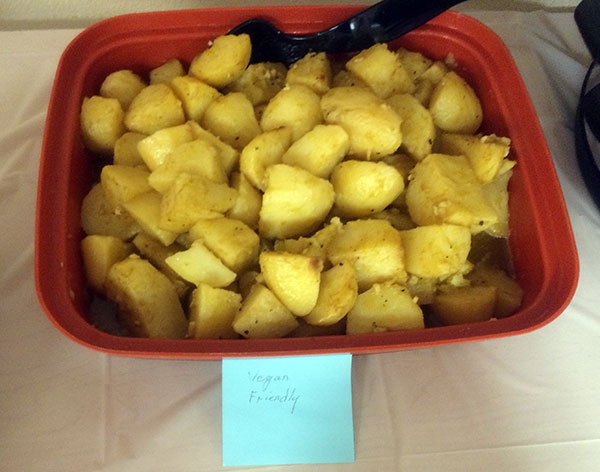 One co-worker even brought a vegan friendly potato dish and labeled it for me – how sweet! He eagerly explained how he used vegan butter and veggie broth for the seasonings instead of dairy butter and chicken broth. And he wanted my opinion on it since his son is vegan too and he’s planning to serve it when they visit, so cool. 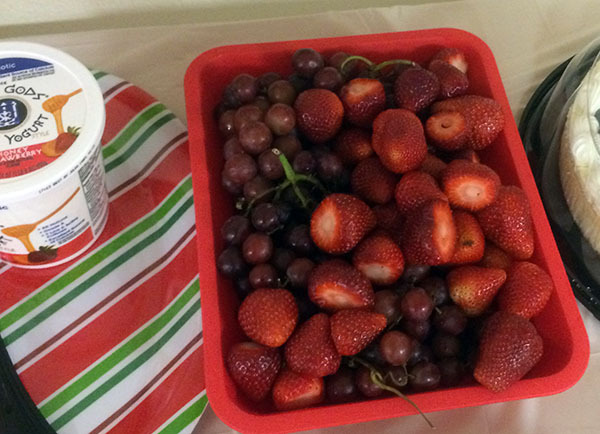 Someone also brought fruit with yogurt, I skipped the yogurt. And I went a little lazy bringing chopped veggies with hummus people could scoop onto their plate. I thought it was a good idea and a whole food healthy option that I could be happy living on. My plate ended up being a gorgeous load of fruits and veggies with lots of color. And it was the prettiest plate there. I’m enjoying these potlucks more just to quietly observe what other people load their plates with. 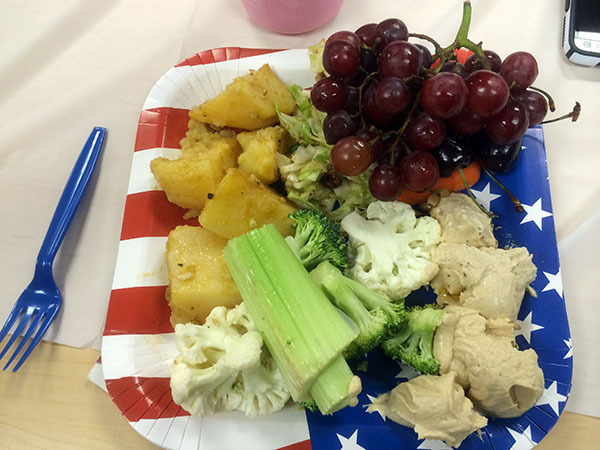 There was a lot of summer-themed BBQ dishes and a lot of plates were loaded with brown meat – ribs, pulled pork, etc. and not very colorful at all. I was surprised how many people went back for multiple heaping plates of meat with little to no veggies. When we were packing up the leftovers, one guy proudly told me he served himself some of the veggies and tried to eat a couple of pieces, but didn’t have a lot of room left. Uh, good for you? But I will continue to bring veggie loaded dishes for those that want healthier options. And the leftovers have been great in my smoothies the last couple of days. 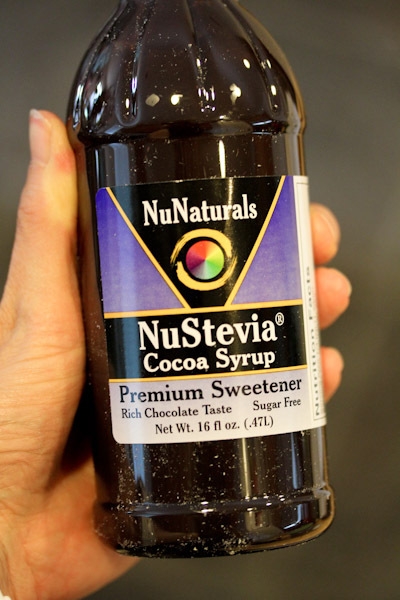 Another product that’s great is smoothies is NuNaturals Cocoa Syrup. I like that it has a simple list of four ingredients – basically cocoa powder, water, and stevia. By itself, it has a rich, dark chocolate flavor with a slight sweetness, but not that sweet, a rich dark chocolate syrup. I also tried it on a very simple and basic dessert, processed frozen banana ice “cream”. 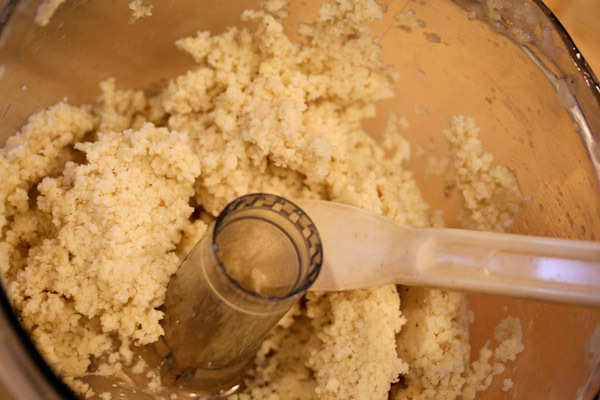 I just dumped frozen banana slices into my food processor and processed them into an ice cream-like texture. 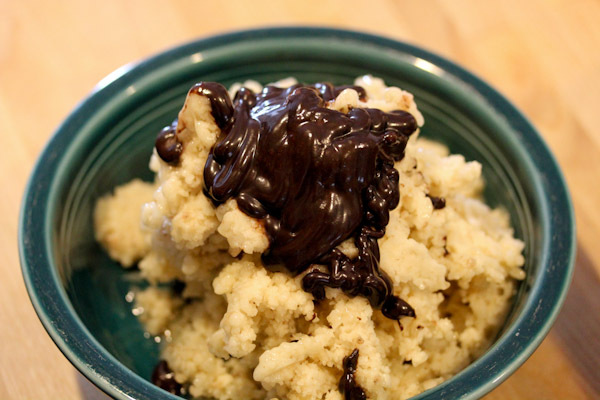 Scooped into a bowl and poured the chocolate syrup on top messily. Yeah, I wasn’t going for any presentation marks here. But for a no-sugar added dessert, it was a nice treat. The sweet bananas blended nicely with the dark chocolate syrup and I didn’t feel like it needed anything else. I’m impressed with how nice the syrup tastes without sugar and what a great product this is for people with diabetes since it does not have a long list of processed chemical ingredients. I approve of it in smoothies and on banana ice “cream” so far and it would be perfect for dipping strawberries. 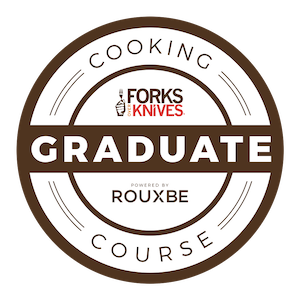 More to come with recipes and eats as I get back into a grove after the busy week. That syrup looks neat! LOVE the plate and all the food you chose to put on it, too! !